Gerard Audran , the third son of Gerard Audran Senior, followed his brother Claude to Paris in 1666 and joined him in Charles LeBrun's studio where Claude was an assistant to the master. Gerard was already skilled in engraving, having surpassed his father in the craft and soon engraved some of LeBrun's giant historical paintings. He travelled to Rome and produced more engravings which were praised for their technique and liveliness. 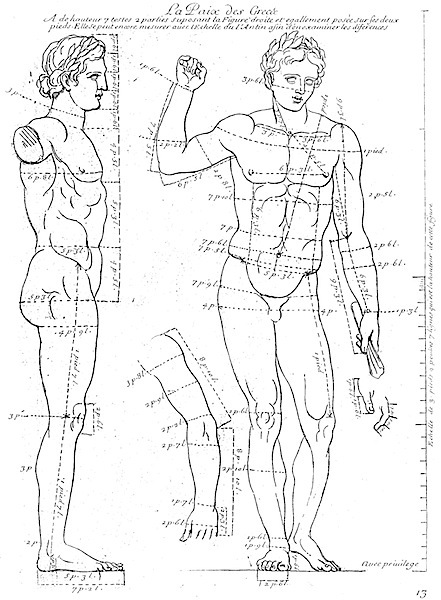 In 1683 he produced Les Proportions du Corps Humain which was a careful rendition of the famous statues of antiquity including careful measurements of each which according to Johann Gottfried Schadow were taken by his brother Claude. 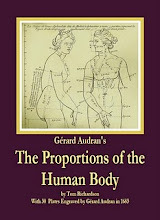 Pictured is the cover of a new edition titled The Proportions of the Human Body . The genius of this work though was to change those measurements into proportional measurements which could be used by all artists to apply to their own works in order to achieve the beauty of the classic form. 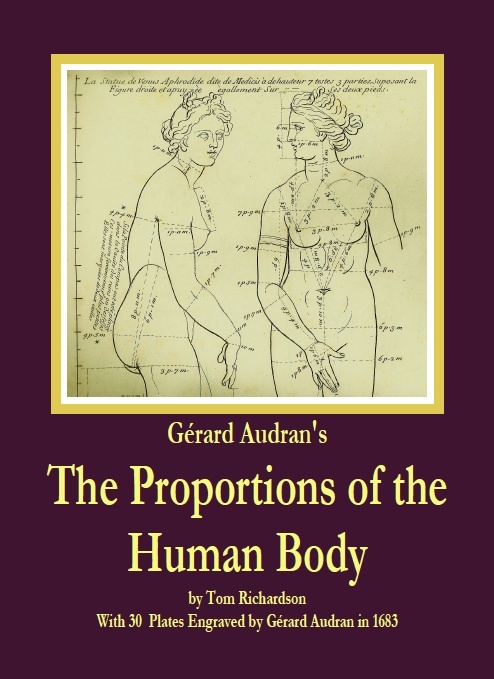 This is a new edition of Gerard Audran's engravings with a text that I translated to the best of my ability and some additional engravings of the classic statues so that the outline drawings with measurements that Audran made can be compared to a version rendered to look three dimensional. 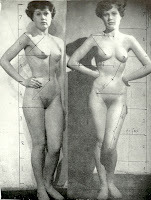 Les Proportions du Corps Humain, Mesurees sur les plus belles Figures de l'Antiquite an original copy. In addition to the engravings we have named after Poussin and Charles Lebrun, we must mention as exceptionally superior works by Gerard Audran, 'The Burning Bush,' after Raphael ; ' The Martyrdom of St. Gervais and St. Protais ;' ' The Aurora ;' and ' The Martyrdom of St. Lawrence,' after Eustache Lesueur ; 'The Plague of Egina ;' 'The Cupola of the Val de Grace;' and 'The Ceiling of the King's Chamber at Versailles,' after Pierre Mignard. A few engravings after the statues of Michel Anguier, Gaspard de Marsy, and Girardon, close our list of this indefatigable artist's excellent works. Until his death at Paris on the 26th of July, 1703, Gerard Audran devoted his great talent to the fine arts. 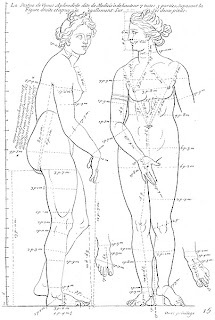 We have also a treatise embellished with engravings by this master on 'The Proportions of the Human Body, after the finest Figures of Antiquity.' This work is still worthy of the honour in which it has been held since its publication (1683). Related Book on the use of drawings to transmit artistic ideas from one region to another and throughout time, these hand made books were called "model books" and this book discusses them and gives examples. 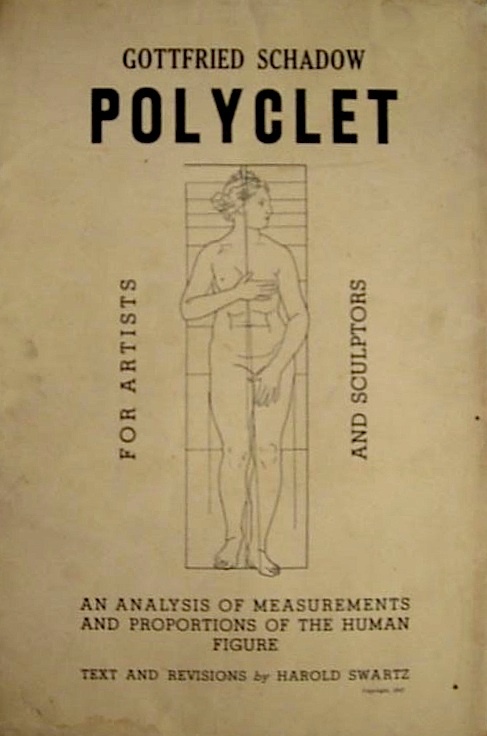 Polyclet;: An analysis of measurements and proportions of the human figure for artists and sculptors; Text and Revisions by Harold Swartz a 1947 republication. Harold Swartz was an instructor of sculpture at the Chouinard Art School in Los Angeles as well as being a sculptor, writer and lecturer. Original German text at Google Books. 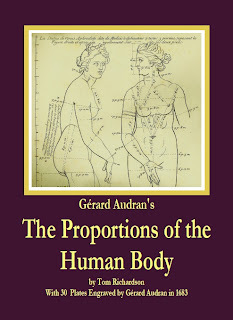 2008 Republication: The Art Student's Guide To The Proportions Of The Human Form . 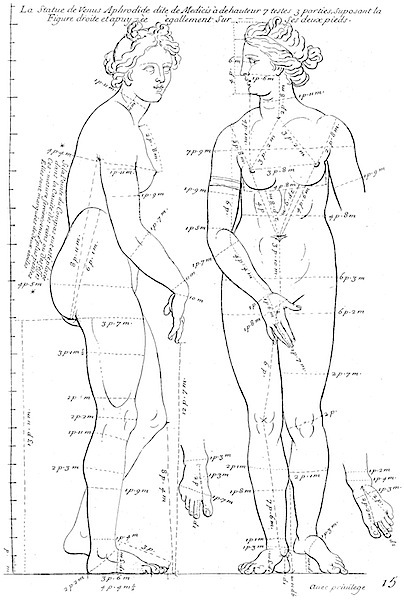 Anthropometry (Greek άνθρωπος, man, and μέτρον, measure), refers to the measurement of the individual to understand human physical variation. This is a link to a page about measurement techniques: Anthropometric Measuring and Fundamentals. It was used first to identify criminals, but was such a complex system that it eventually gave way to fingerprinting. Link to a page with a description of Alphonse Bertillon' measurement technique. Link to a standard anthropometry card with Alphonse Bertillon;s photograph. 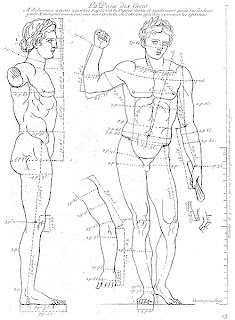 Syracuse University forensics course page with samples of anthropometry cards. More Bertillon cards at the National Institute of Health. Link to a Rutgers University page describing facial measurement techniques. More recently it is used in clothing manufacture and footwear. This page has an example from NASA which shows its use in designing space suits. Carl Schmidt's method is reflected in the book by John S. Barrington, who was a physical culture enthusiast and specialized in male models and published books of models to be used as art studies. Here is a review of a book about his life: The Independent. Physique: The Life of John S. Barrington .